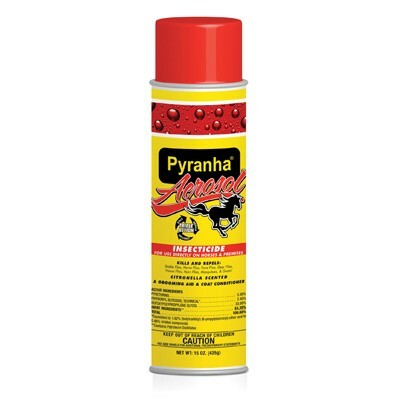 Pyranha Fly Aerosol Can 15 oz by Pyranha controls stable flies, horse flies, deer flies, houseflies, horn flies, gnats and mosquitoes on horses. Has 0.3% Pyrethrins. Spray about 3 seconds on each side. Repeat if necessary. May be used as a wipe. Citronella scented.